Constipation is a terrible problem that many children have. I used to be one of these children and I hated each time I did not have regular bowel movements. When we are little, it is up to our parents to help us go to the bathroom regularly. As we grow up and into adulthood, it becomes our responsibility. We are old enough to research on our own to find ways to have regular bowel movements. Which I did, as I did not want to suffer from constipation anymore. I also promised myself that I will help my children avoid the same problems with constipation that I had in my childhood. And I have been successful so far. Today I am going to talk about a change that is pretty easy to implement. Eat more fruits and vegetables. However, if we focus on eating certain fruits and vegetables, especially during the period of constipation, we will be more likely to succeed in achieving relief. 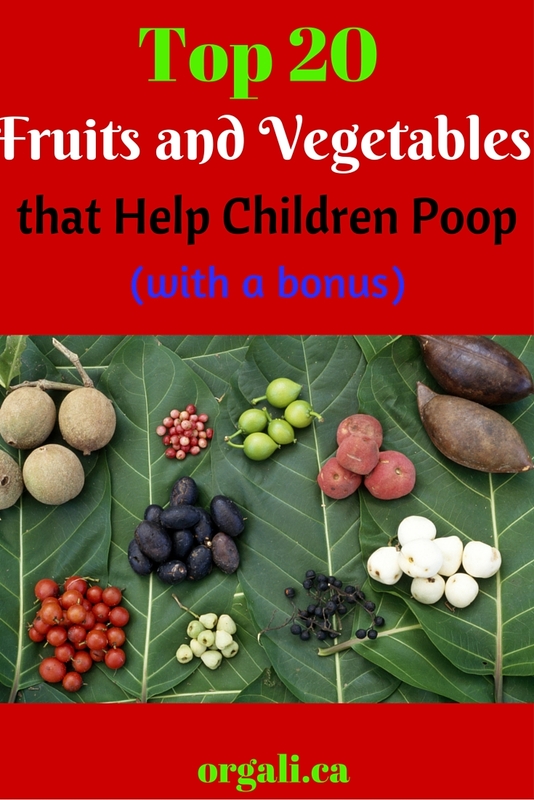 Here are my top 20 fruits and vegetables that help our children poop (with a bonus) as they have a high content of water and fiber. Do you want to get the most out of these lists? Mix and match them. Make a smoothie with a variety of fruits from this list. Add spinach as a bonus. Make a salad with lettuce, cucumber, celery, cauliflower (or use your child’s favourite vegetables), drizzle a little bit of olive oil, add some blueberries and voila! Great tasting salad with amazing benefits. Not only rich in minerals, vitamins, and antioxidants, but also rich in water and fiber that ensure a smooth passage of number 2. Make a stew featuring their favourite vegetables from the above list. There are many things that we can try to help our children (or us) have regular bowel movement. And here is a recipe for Vegetable borscht that features some of the vegetables mentioned above (and many others), is delicious, and can help your child (and you) poop. Are you feeling frustrated and overwhelmed? Is your child taking laxatives or other medications to help them poop, but you wish they didn’t have to? We can talk about the many ways to get rid of constipation and together we can come up with a personalized plan that will help your child go to the bathroom regularly in no time. It is easier than you think. Together we can do this. Do you have any questions about constipation? I would love to hear from you! Please comment below or contact me here. I reply to ALL messages I receive.